D&H Distributing, the leading North American computer products and consumer electronics distributor, announces it has won Top Distributor in The ASCII Group’s 2016 Distribution Survey, winning or tying more categories than any other broadline distributor. The company won six categories and tied four more, earning ten of the highest rankings in the survey. Two of the areas where D&H excelled (timely shipment and accurate shipping) were singled out by members as the most important of the categories. The ASCII survey asks more than 100 resellers within the group’s membership to quantify their buying habits and experiences with their distribution partners in 16 different areas. 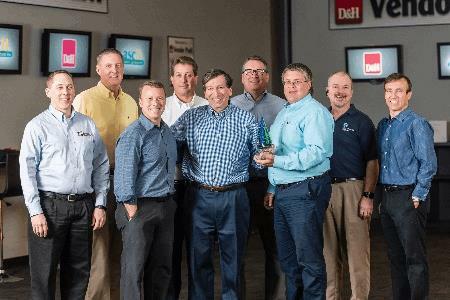 D&H has in fact earned the highest number of wins/ties of any broadline distributor in the ASCII survey every year since the report was first established eight years ago. The survey revealed further insights about D&H and its relationship with ASCII’s mostly-SMB reseller membership. For example, more of the surveyed ASCII members maintain a distribution partnership with D&H than any other distributor in the report. And D&H scored an above-average rating in 12 of the 16 categories. ASCII’s Chairman and CEO Alan Weinberger and Chief Operating Officer Doug Young visited D&H’s Harrisburg headquarters on February 22 to present the distributor with an in-person award, recognizing them as the top performer in the survey. Several regional ASCII members also attended the presentation to demonstrate ongoing support for D&H’s offering. D&H customers can call (800) 340-1001 for more information or to find out how to become a D&H customer. Visit www.dandh.com. PHOTO CAPTION: ASCII executives present D&H Distributing with its distribution survey winner award at a D&H’s Harrisburg, PA, headquarters, along with some mutual ASCII and D&H reseller partners. Bottom row, L-R: Jeff Schmidt of Elk Systems, D&H Co-President Dan Schwab, ASCII Chairman and CEO Alan Weinberger, D&H Director of Inside Sales Pat Donovan, Bob Swensen of Total Technology Solutions, D&H Co-President Michael Schwab. D&H Distributing believes the most important element of doing business is developing relationships for mutual success. The company continues to build upon its 99-year-old culture by providing its manufacturers, co-owners, and partners with the utmost customer care, consultative guidance and multi-market expertise. As one of North America’s leading technology distributors, it delivers a wealth of enablement resources and hands-on support services that empower resellers in the IT channel. The company engages with solution providers, integrators, and VARs to meet current business challenges, as well as forecast their evolving, real-world needs and prospects for lucrative growth opportunities. D&H maintains a special focus on independent VARs expanding their competencies in areas such as hosted and cloud services, the modern mobile workplace, comprehensive SMB server networks, and cross-market expertise across the small business, education, healthcare, and government verticals, to name a few. The company's value proposition includes professional marketing resources, a new transactional service model, dedicated Solutions Specialists, and a highly-lauded webcast training venue; plus reseller engagement events such as technology trade shows, roundtable opportunities, training “track” sessions, and hands-on "lab" sessions. The distributor is headquartered in Harrisburg, PA, in the US and in Brampton, Ontario, in Canada. For more information, visit www.dandh.com.